his is the day that the trail will cross the provincial border Südtirol – Trentino, roughly halfway through the route. The morning begins leisurely by leaving the small village and hiking along comfortable trails descending into the creek Rio Novella. The scenery at the cool bottom of the creek is wild and quaint. Soon afterward are the sprawling meadows surrounding the village of St. Felix, and with an easy hike the church in the village center is reached. It is here the ascent to the pond called the Felixer Weiher begins. 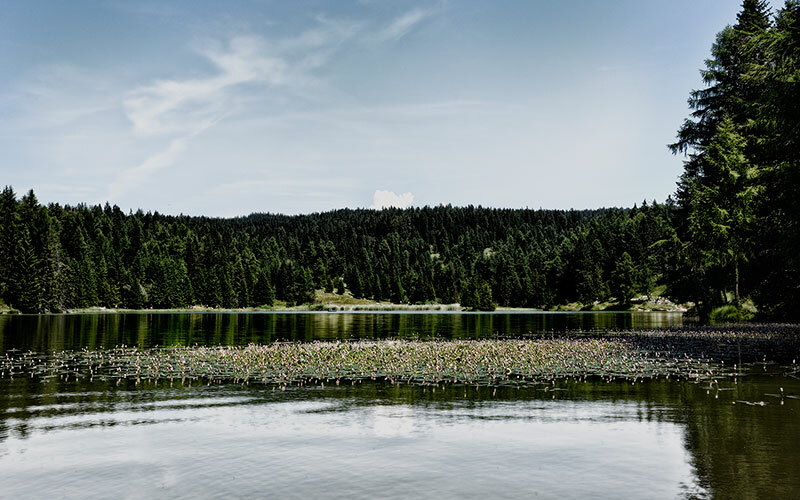 The pond lays close to the provincial border and therefore carries two names; the South Tyroleans know it as the Felixer Weiher, while in Italian it is referred to as Lago di Tret. The hike up to the pond is a relatively comfortable endeavour and once there, the area and environment is inviting of a good rest. Soon afterward is the crossing into the province of Trento, and the short hike down to the alp Malga Tret begins. What follows is the long descent to the village of Fondo. The beginning involves a hike along a nice forestry trail, which meets a forestry road lower down. Unfortunately, the hike along this road, which is closed to traffic, is rather exhausting. A nice compensation for this stretch is the arrival at the small lake Lago Smeraldo and the short hike through the canyon “il Burrone” which leads to the village center of Fondo. Follow the trail marker 1 (signs) from the village square of Unser Liebe Frau im Walde (1352 m) and walk along the paved farm access road, always following the marker 1 down into the creek Rio Novella. At that point there will be signs indicating the way to the village of St. Felix (1267 m). The trail is identified by the trail marker 1A. Hike to the center of the village and directly across the church start ascending (sign “Felixer Weiher” – trail marker 9). At the beginning of the toboggan run, which turns into a forestry road during the summer months, a parking area is reached. The way to the Felixer Weiher is once more indicated by signs (trail marker 9). The next stretch alternates between hiking along the forestry road in some parts and taking a shortcut along steeper sections in other parts, up until a left turn. At this point, leave the road and commence walking straight uphill, following a trail (sign “Felixer Weiher”), to a small pond. Once at this small pond (1605 m), turn right (sign “Tret”). It is important to watch for the next sign indicating “Tret” (trail marker 512)! The trail briefly follows the edge of the pond, and at the east end of the bank there will be signs indicating the way to the alp Malga di Fondo. 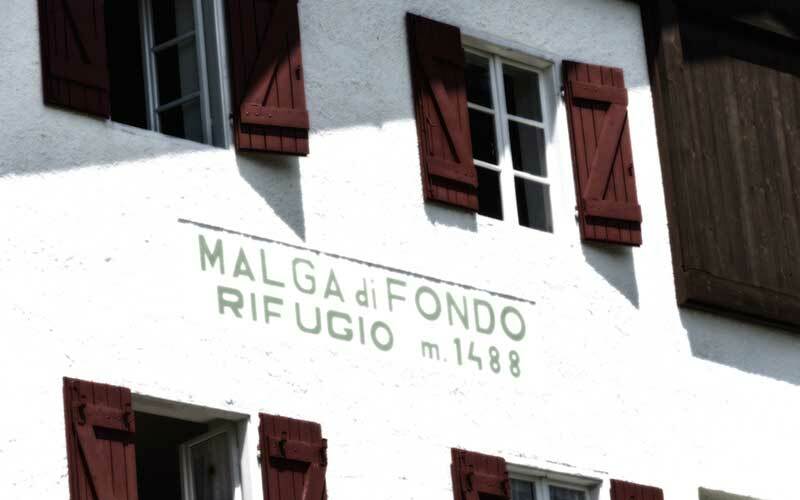 A pleasant hike along alpine meadows leads to the next turnoff; continue going straight (to the right trail 57 branches off) and watch for the signs for Malga Fondo (1480 m). The trail marker is 511. Hike down to the alp building and follow the indications for Fondo (trail marker 511). At the beginning the trail consists of a nice, grown-in forestry trail which eventually meets the forestry road to Fondo. Follow this somewhat uninteresting road to the lumberyard, where the asphalt road begins. Hike to the coliseum and turn left directly after the building (no trail signs or indications). Cross the river and hike on the left side to the lake “Lago Smeraldo“. Follow the lakefront almost to the end and climb down metal stairs into the canyon “il Burrone” (signs). The trail follows the canyon and eventually meets a small road on the right side. Exit the canyon along this road and continue up to the main square of the village of Fondo (978 m) with its huge water powered clock. Carry on straight ahead and then cross the road to get to the local tourism association (Pro Loco). After the church of St. Felix turn right, walk down the road and follow the so-called “Wasserfallweg” to the Hotel Aurora in the village of Tret. Continue on to the village center and follow the trail marker SAT 542 to Fondo. This used to be the old connection road between Tret and Fondo. Expenditure of time from Tret to Fondo approx. 2 hours. Terrain: 5.3 km asphalt and 11.7 km forest- and meadow trails, path, forestry road. Restaurants in St. Felix and the alp Malga di Tret (open from June 15 to September 15).